When Pulitzer- and Tony Award-winning playwright John Patrick Shanley writes a romantic comedy, it rarely fits the conventional perception of that term. Anyone who has seen the Shanley-written Moonstruck or Joe Versus the Volcano has already gotten a strong sense of that. You might not necessarily see it coming from the set-up for Outside Mullingar, set on two neighboring farms in contemporary Killucan, Ireland. Widower Tom Reilly (Max Robinson) and his 42-year-old, never-married son Anthony (Tom O'Keefe) live beside Aoife Muldoon (Sybil Lines) and her 30-something, also-never-married daughter Rosemary (Amy Bodnar). And plenty of history exists between the families, at times antagonistic but also built on never-expressed emotions. Julie Kramer's simple production keeps the focus on the four actors, and a typically charming script by Shanley that offers plenty of laughs while we're allowed to watch the characters evolve. There's an unfortunate tendency for some of the punch lines to be delivered as the performers turn toward the audience—as though anticipating the laughter—but there's a genuineness to the interactions between them that delivers some surprisingly raw emotion. 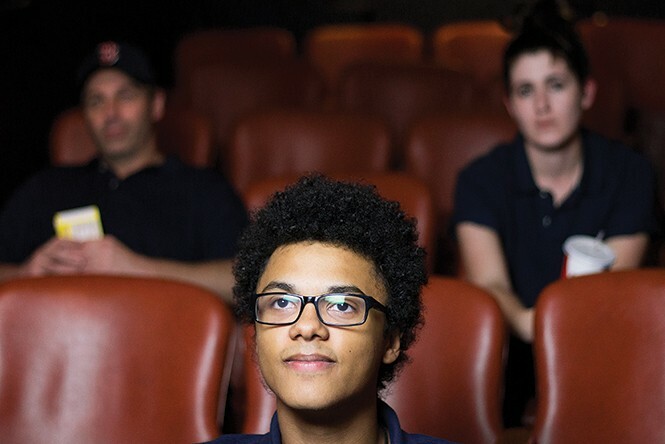 In the first act of Annie Baker's The Flick, movie usher Avery (Avery Franklin, pictured below) sits in an empty theater on the phone—presumably with his therapist—explaining a recent dream he had: In order to enter heaven, he has to find a movie that will get him out of purgatory. After scanning hundreds of movies—most of them with pretentious-sounding titles—it's an old VHS copy of Honeymoon in Vegas that grants him access to the afterlife. Even Avery is perplexed by such an odd cinematic choice. The seemingly insignificant moment establishes the tone for The Flick. Set in the last 35mm-projected movie theater in Massachusetts, this slice of life production follows Avery, fellow usher Sam (David A. Boice), and projectionist Rose (Kaylee Lloyd) as they navigate the mundane aspects of their jobs interspersed with tidbits of their personal lives. While this gives each character a small arc, it's the movie banter between Sam and Avery that's most entertaining to watch. From making fun of Avatar and The Tree of Life to playing "6 degrees of separation," Avery proves he knows movies. It's been a while since Salt Lake City audiences have had a chance to see Aaron Swenson—whose electrifying Hedwig and the Angry Inch rocked local theaters in productions spanning 2003-12—single-handedly take command of a stage. In case there was any reason for doubt: He still knows how to do it. Jonathan Tolins' let-there-be-no-question-that-this-is-fictionalized tale was inspired by a quirky real-life footnote: a coffee-table book written by Barbra Streisand about her lavish Malibu estate, which showed a basement designed like a quaint boutique shopping mall. The speculative premise imagines under-employed Los Angeles actor Alex (Swenson, pictured) answering an ad to serve as the sole employee of that "mall," maintaining the pretense that it's an actual shopping destination whenever "The Lady of the House" comes calling. Swenson takes on multiple roles throughout the 95 minute show—including Alex's boyfriend, Streisand's personal assistant and, of course, Barbra herself—and it's a tour-de-force of physical acting. The voice changes are almost incidental to the way director Teresa Sanderson and Swenson find a single trademark gesture, like the assistant's world-weary over-the-shoulder glare, to convey a change of character. Add the hilarious exchanges in Tolins' script, and Buyer & Cellar becomes almost criminally entertaining.